Dr. Lee is an Instructor of Psychiatry at Harvard Medical School and Massachusetts General Hospital. 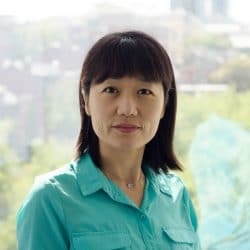 She received a BS in Computer Science from Seoul National University (Korea), MSc in Bioinformatics in KAIST (Korea), and her Ph.D in Computational Biology at Queen’s University (Canada). Dr. Lee completed postdoctoral training in Statistical and Psychiatric Genetics at MGH. Her research focuses on developing and applying analytic approaches to understand the genetics of complex neuropsychiatric traits and disorders. What analytic approaches would facilitate the search of genetic risk factors and mechanisms underlying complex traits? Which neurogenetic risk factors contribute to the onset of psychiatric disorders? What is the shared neurogenetic basis of distinct neurodevelopmental disorders, such as autism and schizophrenia? 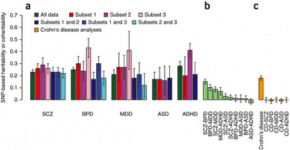 Whole Genome Sequencing Data Analysis of Autism. My current research aims to develop a unified statistical framework and accompanying computational software to analyze whole genome sequencing data. In particular, I am interested in applying this framework to study the genetic etiology of autism spectrum disorders (ASD). Advances in next generation sequencing technology have provided a powerful, unbiased way to dissect the complex genetic architecture of ASD. Multiple, independent exome sequencing studies have demonstrated an etiologic role of de novo loss-of-function mutations, as well as the discovery of rare inherited risk mutations. 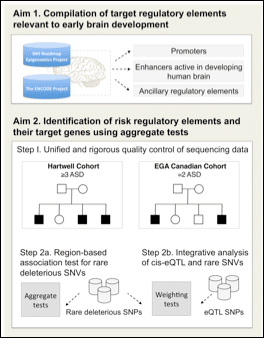 While encouraging, our understanding of the genetic landscape of ASD is still far from complete; Evaluation of rare genetic variants has focused on protein coding regions – overlooking more than 97% of the human DNA – as a result of limited power due to small sample sizes. Another crucial challenge is a lack of analytic strategies that can effectively harness the enormous number of non-coding variants. To address these challenges, I have secured access to genetic data on people with autism, specifically whole genome sequencing data of ASD (N=2,500) through collaborations with the faculty at the Broad Institute, UCLA, and Stanford University. Using this data, we will develop and test effective analytic strategies for the study of whole genome sequencing data. Cross Disorder Analysis of Psychiatric Disorders. The second line of my research focuses on clarifying the nosologic boundaries and etiologic overlap among mental disorders. Psychiatry is the only medical field that defines disorders based on descriptive symptom profiles instead of pathologic evidence. Thus, to make categorical distinctions between ‘normal’ and ‘disordered’ with respect to mental functioning, arbitrary decisions are inevitable. Furthermore, there is obvious overlap of clinical symptoms across various psychiatric and neurodevelopmental disorders, making it challenging to draw diagnostic boundaries. There is a need to re-conceptualize the nosology of mental disorders that reflects underlying neurobiologic bases. Working towards this goal, I am performing the cross disorder analyses of nine psychiatric disorders currently studied at the Psychiatric Genomics Consortium (PGC) Cross Disorder Workgroup. As of now, we have collected genome-wide association data from 239,551 individuals of 151 PGC study cohorts for this analysis (total of 91,234 cases and 148,317 controls). The final data-freeze of this multi-year international effort is planned in Fall 2016. Neuroimaging Genetics of Brain Traits. The third line of my research centers on GWAS of brain neuroimaging, behavioral, and cognitive measures. A major motivation driving this work is to study the shared etiology of distinct neurodevelopmental disorders using an integrative analysis of genomic and neuroimaging data. This motivation led to my K99/R00 research of social dysfunction in autism spectrum disorders (ASD) and schizophrenia (SCZ). ASD and SCZ are two of the most heritable and pervasive neurodevelopmental disorders. They are markedly distinct in terms of developmental trajectories and clinical presentations. Nevertheless, social cognitive deficits are central features of both ASD and SCZ. Moreover, converging evidence from recent epidemiologic, neuroscience and genetic studies suggest a potential neurobiological link between ASD and SCZ. My K99/R00 research aims to study whether this overlap in social cognitive deficits reflects common etiological mechanisms or represents artifacts of comorbidity or misdiagnosis. 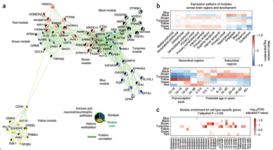 Pathway and Network Analysis to Understand the Genetic Etiology of Psychiatric Disorders. 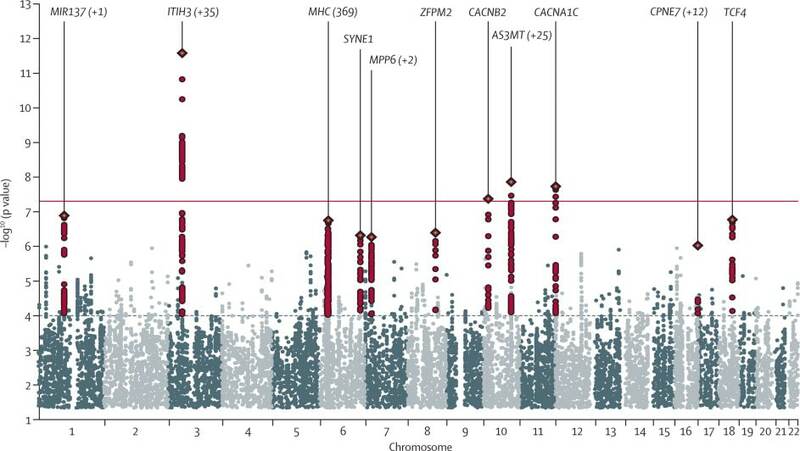 Genome-wide association studies (GWAS) of psychiatric disorders have identified multiple genetic associations with such disorders, but better methods are needed to derive the underlying biological mechanisms that these signals indicate. Our recent work sought to identify biological pathways in GWAS data from over 60,000 participants from the Psychiatric Genomics Consortium (Nat Neurosci, O’Dushlaine*, Rossin*, Lee* et al. 2015; *co-first authors). We developed an analysis framework to rank pathways that requires only summary statistics and combined this score across disorders to find common pathways across three adult psychiatric disorders: schizophrenia, major depression and bipolar disorder. Histone methylation processes showed the strongest association, and we also found statistically significant evidence for associations with multiple immune and neuronal signaling pathways and with the postsynaptic density. Our study indicates that risk variants for psychiatric disorders aggregate in particular biological pathways and that these pathways are frequently shared between disorders. Cross Disorder Analysis of Five Neuropsychiatric Disorders. In the latest cross disorder analysis study published at Lancet (Smoller, Ripke, Lee, et al. 2013), we aimed to identify specific genetic risk variants shared between the five disorders in the Psychiatric Genomics Consortium: autism spectrum disorder, attention deficit-hyperactivity disorder, bipolar disorder, major depressive disorder, and schizophrenia. Using genome-wide single-nucleotide polymorphism (SNP) data for the five disorders in 33,332 cases and 27,888 controls, I applied a multinomial logistic regression procedure with model selection (Lee et al. 2011) to identify the best-fitting model of relations between genotype and phenotype. Model selection analysis supported effects of these loci for several disorders. Loci previously associated with bipolar disorder or schizophrenia had variable diagnostic specificity. I also performed pathway analyses using INRICH (Lee et al. 2012) to establish the biological associations underlying genetic overlap for the five disorders. This multivariate analysis supported a role for calcium channel signaling genes for all five disorders. Finally, I used enrichment analysis of expression quantitative trait loci (eQTL) data and showed that SNPs with evidence of cross-disorder association were enriched for brain eQTL markers. Partitioning Heritability Analysis to Study the Complex Neurogenetic Architecture of Schizophrenia. Schizophrenia is a devastating neurodevelopmental disorder with a complex genetic etiology. 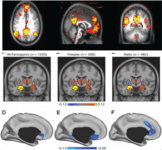 Widespread cortical gray matter loss has been observed in patients and prodromal samples. 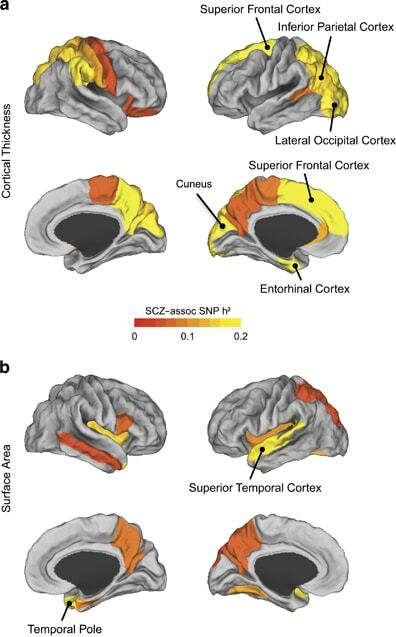 However, it remains unresolved whether schizophrenia-associated cortical structure variations arise due to disease etiology or secondary to the illness. Our recent work published in Molecular Psychiatry (Lee et al. 2016) addressed this question using a partitioning-based heritability analysis of genome-wide single-nucleotide polymorphism (SNP) and neuroimaging data from 1,750 healthy individuals. We find that schizophrenia-associated genetic variants explain a significantly enriched proportion of trait heritability in eight brain phenotypes (false discovery rate=10%). In particular, intracranial volume and left superior frontal gyrus thickness exhibit significant and robust associations with schizophrenia genetic risk under varying SNP selection conditions. 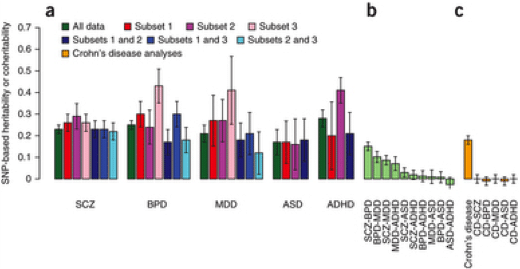 Cross-disorder comparison suggests that the neurogenetic architecture of schizophrenia-associated brain regions is, at least in part, shared with other psychiatric disorders. 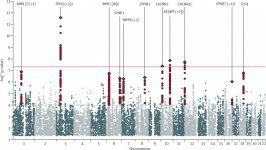 Our study highlighted key neuroanatomical correlates of schizophrenia genetic risk in the general population. These may provide fundamental insights into the complex pathophysiology of the illness, and a potential link to neurocognitive deficits shaping the disorder.